The river had been in flood for the last week and with the last few nights of frost it was starting to clear quickly. Andy and I headed off to the lower end of the Bristol Avon in search a of few croc’s. Dead baits and sink and drawing was to be the method. Sure enough the river had gone down and was much clearer than both of us thought it would have been. Our hopes were high as we started to cast around, but nothing came from our first few swims. The only thing we did catch was Andy rescued two small perch from a very small muddy puddle. Not even deep enough for the fish to swim upright. Heaven knows how many fish will have been lost to the floods again. 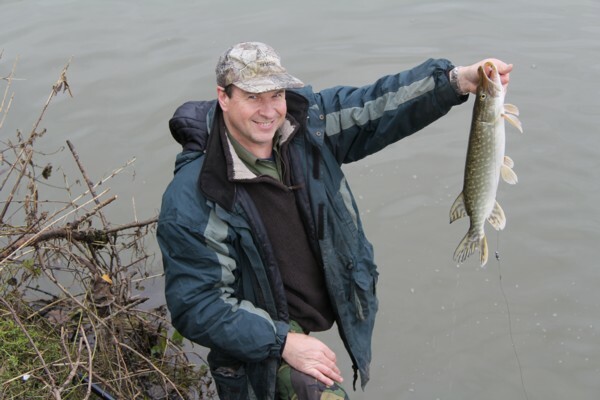 It wasn’t a great year for spawning either so this year class will have struggled too. Moving on towards another much larger slack which had to be full of feed fish it was Andy who got straight into the action. As you can see it turned out to be a small jack. With our spirits high it was my turn next to have a take. Unfortunately it didn’t stay connected for long and that was it. 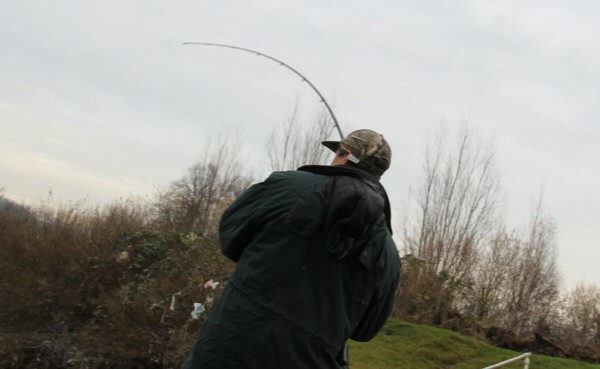 We continued fishing with various anglers coming along to ask how thing were going. There was a steady flow of them for most of the afternoon. I had one more take again from a small pike which stayed on. Only a little one though. Between the two of us we both agreed that the place must get so much attention from other pike anglers that the larger fish were not present. Maybe if the river was another 4 ft higher or so it would be different. So I think the next adventure will be after some large perch again from another commercial fishery. Lets hope Andy or I manage a big stripy. This entry was posted on Sunday, December 2nd, 2012 at 9:00 pm	and is filed under Uncategorized. You can follow any responses to this entry through the RSS 2.0 feed. Both comments and pings are currently closed.